Eggert, LS, Powell DM, Ballou JD, Malo, AF, Turner, A, Kumer, J, Zimmerman, C, Fleischer RC, Maldonado JE. 2010. 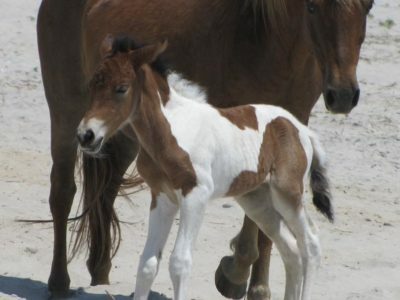 Pedigree and the study of the wild horse population of Assateague Island National Seashore. J. Wildl. Manage. 74:963-973. This is probably the definitive paper on the genetics of a wild horse population treated chronically with PZP. Lyda, Robin O., Kimberly M. Frank, Roberta Wallace, Nadine Lamberski, Jay F. Kirkpatrick. (2013). Immunocontraeption of Captive Exotic Species: V. Prolonged Antibody Titers in Dall Sheep (Ovis dalli dalli) and Domestic Goats (Capra hircus) Immunized with Porcine Zona Pellucida. JZWM, Vol. 44,(4S): S21-S25. Kirkpatrick JF, Turner A. (2008) Achieving population goals in long-lived species (Equus caballus) with fertility control. Wildl. Res. 35:513-519. Kirkpatrick, J.F. (2007) Measuring the effects of wildlife contraception: the argument for comparing apples with oranges. Reproduction, Fertility and Development 19, 548–552. Kirkpatrick, JF, Lyda, RO, Frank, KM. 2011. Contraceptive vaccines for wildlife: A review. Amer. J. Reprod. Immunol. 66:40-50. Kirkpatrick JF, Turner A. (2007). Immunocontraception and increased longevity in equids. Zoo Biology 26:237-244.